Hey everyone! Today I have a post which I'm super excited to show you, using the 4 new Barry M nail art pens. They were released in Superdrug and online today (10th April) and will be released in Boots on the 17th April. As you will see, I highly recommend getting at least one of these pens because they're awesome and completely unlike any other nail art pens I've tried before. More after the jump! First up is the White Nail Art Pen. The design I chose to do was inspired by this Nancy Mc design, which I've wanted to do for ages but haven't had the courage to do with a brush. I started with a base of OPI - Just a Little Rosti at This and then drew a line followed by two dots on either side for the bone, then I topped it all off with a coat of Seche Vite. I also did a matte version of these nails, because you know I can never resist, which do you prefer? As you can see the nib is unlike most nail art pens. Rather than squeezing thick nail varnish through a tiny needle (which always gets blocked) you instead push the end of this down until the nail varnish flows through it. I'm not entirely sure if this is pure nail varnish, because although it's super opaque it's a lot runnier than usual, but it's definitely better than any other nail art pen I've tried. This Silver Nail Art Pen was probably my least favourite of the bunch. In person the silver looked completely opaque so if you're not a nail blogger like me it shouldn't matter, but the camera made these look quite translucent. I think I may have done something wrong and I shall be trying this again to make sure because the rest of the pens are great. My only issue with this is the opacity, and another layer over this would have solved that, so overall it's still a great pen. For this design I painted 2 layers of Barry M - Black, and then I painted a layer of Barry M - Aqua Green over the top for the duochrome effect. 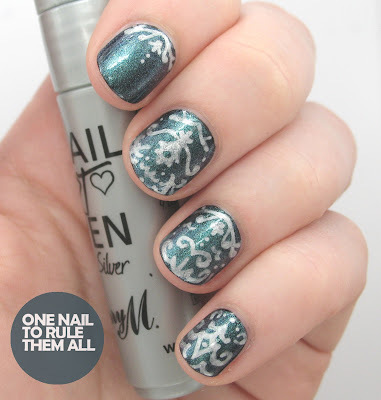 I painted on the baroque print using the silver nail art pen and topped it off with a layer of Seche Vite. I absolutely love this Pink Nail Art Pen, and I'm so glad they chose to include it as it gives a burst of colour to the collection. I really hope they bring out more shades because my experience of these so far has been nothing but positive! (Blue perhaps?) This pink is super opaque and dries really quickly. 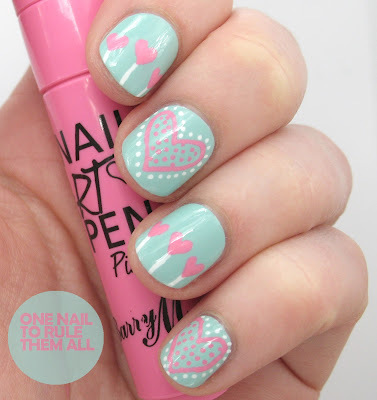 Anyway, for this design I started with a base of Essence - That's What I Mint and then I painted on the hearts in pink, then I outlined them with dots and added the lines using the White Nail Art Pen. Then I topped it off with a coat of Seche Vite. 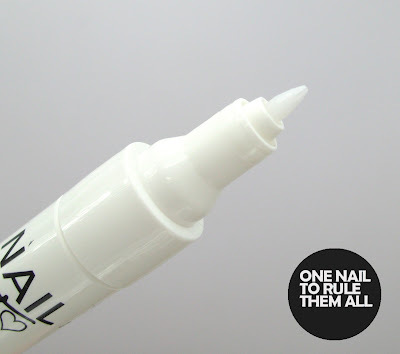 Last but not least is the Black Nail Art Pen, This and the white are my favourite of the pens, they're opaque and easy to use, as are all the pens, but I absolutely love creating nail art with black and white, so I'm sure you'll be seeing a lot more of these. For this design I started with a base colour of an unknown purple, and then added Sinful Colours - Frenzy over the top. To smooth it out I added a coat of Seche Vite before doing the rest of my design. I then drew the outline of the bow in Essence - That's What I Mint, using a MASH - medium length striper brush, and when that was dry I added the spots using the White Nail Art Pen, and then outlined it in the Black Nail Art Pen, topped off with another coat of Seche Vite. These nails were inspired by this design by Lexi over at Finger Painted, but I'm afraid it's nowhere near as good! Overall I'm super impressed with this collection. They're wonderfully opaque, except my slight issue with the silver, they dry fast and they're not thick at all so they wont smudge with a top coat if you apply it soon after. I really hope Barry M bring out more shades of these pens because I think they're brilliant and you'll definitely be seeing more designs using these on my blog over the next few months. What do you think? Will you be picking up any of these colours? And which is your favourite design I created with them? Let me know in the comments! This product was sent to me for review but any opinions included are entirely my own and were not affected in any way. Wow I so need these pens!! Are they available internationally?! Love what you have done with them and such a good review :) Always in awe of your work. Big fan. The bones are super cute!! ;) Kisses from Spain!! Amazing designs! The pink one is a really nice shade of pink. Alice, These are amazing as always! I love the bow and you make it look so easy! 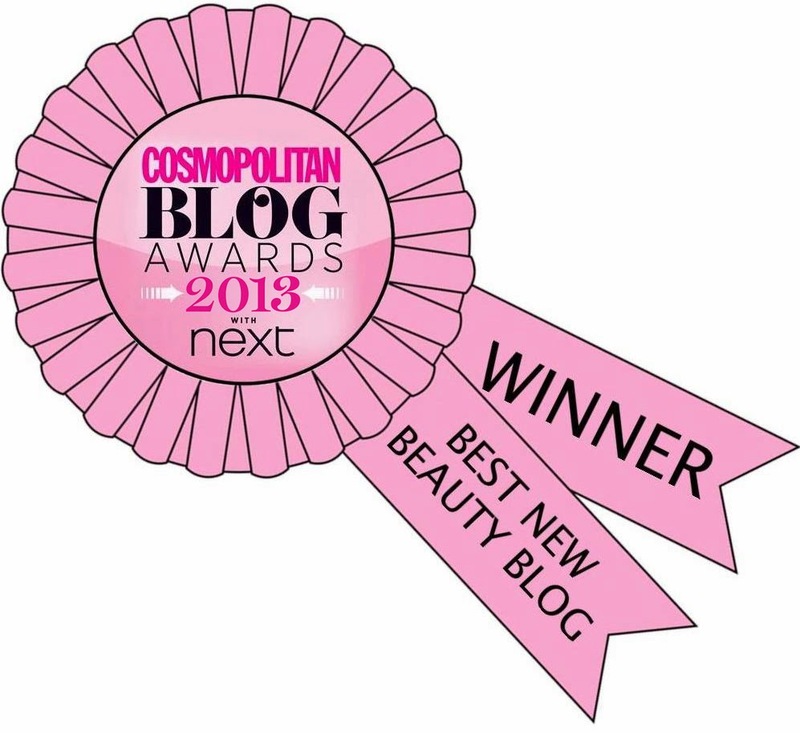 I hope you don't mind but I nominated you for a versatile blogger award on my blog, www.thebeautystop.co.uk. I love the little bones! And happy to see the pink pen. I assumed it wouldn't show up. The little bones design is definetely better in matte! Love all them, though :) Can't wait to get them myself. These look really good! 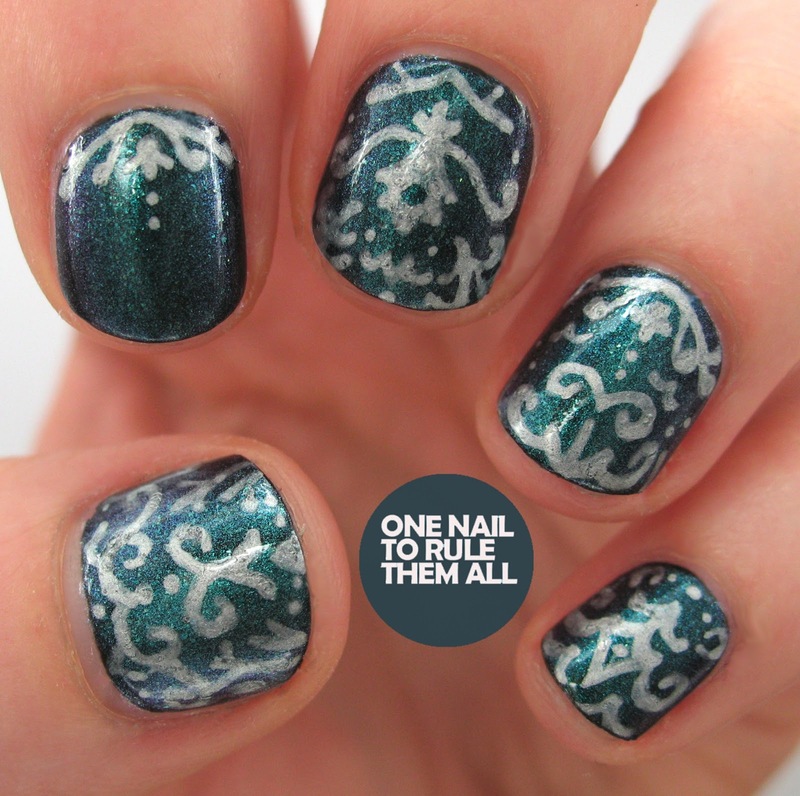 I have a few nail art pens like this that I haven't tried, but now your post makes me want to break them out and see what I can do with them! These look great! Your pics look so pristine, no smearing at all! Did you have to wait any longer/shorter to top coat than you would with regular polish designs/stamping? so much awesome in one post!!! Your bone nails are even better than the Nancy Mc nails! I'd love to try them sometime! These looks amazing! I have such an unsteady hand though, so I'm not sure if I'll get on with them haha. I tried the pens by Topshop and they were a nightmare and the tip seems to be similar. I currently use WAH x Models Own and they are good but take forever to dry. 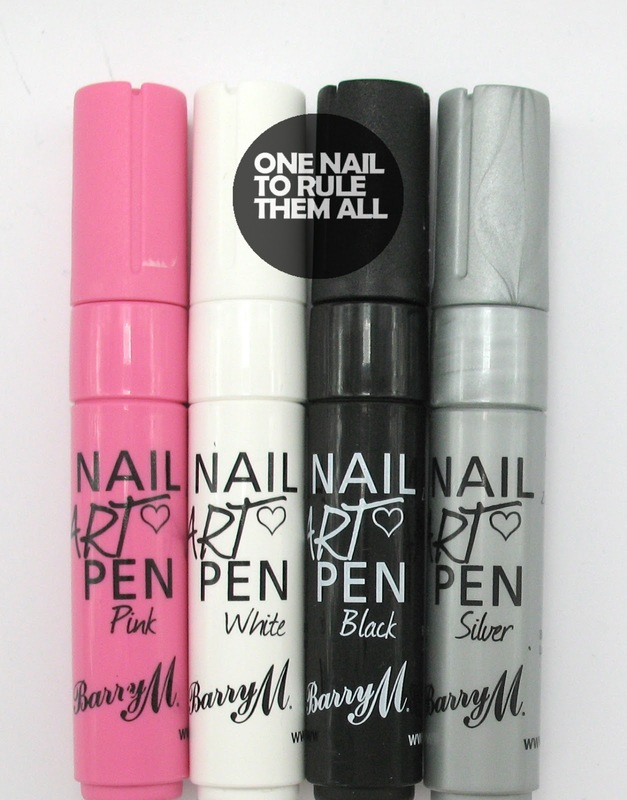 I love the pink Barry M pen though, so I think I'll give them a go. You know what ? It really makes me think of the Sally Hensen nail art pens I just bought ... The tip is the exact same as the Barry M ones, not a needle thingy, and the nail varnish (let's say that it is) is really opaque... Easiest way to do nail art designs on my part :D!! These are adorable!! 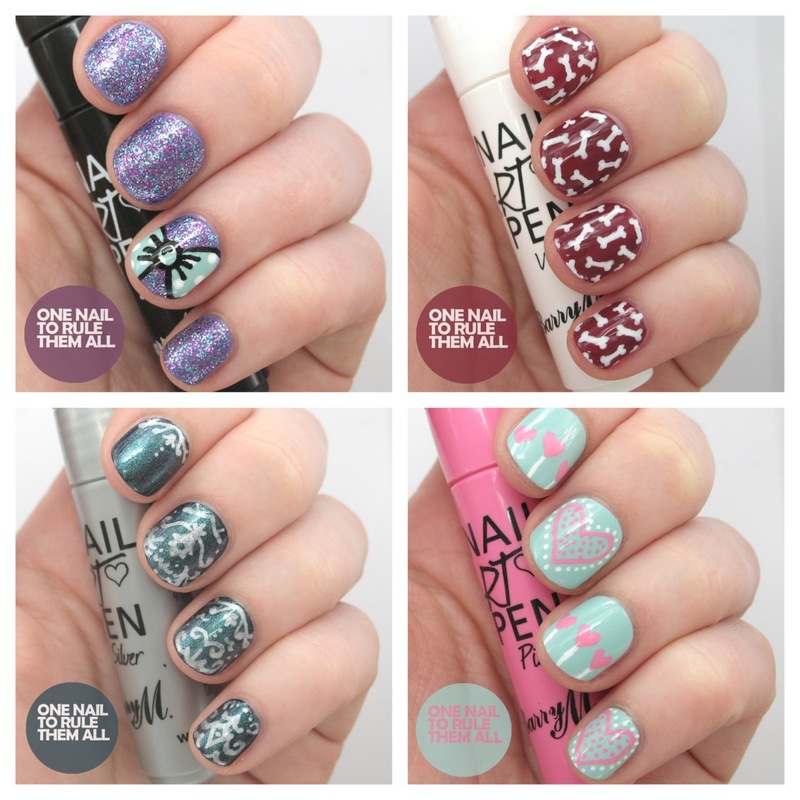 The Sally Hansen nail art pen are like this too .. they work well and have a ton of colors. I don't know if they're actually "nail polish" though because, unless you use top coat, they wash away with water and eventually rub off with normal hand usage. heheh .. Because of that, I like to use the white or silver one to "stencil" or outline a nail art design and then I'll go over it with normal polish. Then before I use a top coat, I'll gently wash the pen markings away. Crystal Goblet - Welcome to Badash Crystal, your online retail shop for crystal candle holders, scotch decanters, paperweights, crystal stemware, glass goblets and glass cylinder vases. As others have said - the bones are incredible! Love them! Super jealous.